I would like to take this opportunity to set the record straight. But first, perhaps a brief bit of background. I have been with my surfer for 15 years now, and happily married for nine. Well, I say happily … I have known for some time now that I am not the only love in his life. To be fair, this is nothing new. Only at the beginning it wasn’t so obvious – perhaps he loved us both equally. But now, sometimes I do wonder. Time to get some waves of my own. When I first met the love of my life, I was bowled over – witty, intelligent, could cook amazing food, incredibly handsome. And he surfed. Plus the feelings seemed to be reciprocated. I had hit the jackpot! We went on surf trips together. We built a life near world class waves. Life really was perfect. However, gradually, my focus moved from the ridiculously early dawnies to the post-surf chill out on the beach, whereas his remained firmly on the water, and how he totally got shacked in that last set wave. My surfing skills (and interest) were not an equal match for his. I became the photographer. This is not the glamorous job portrayed by the ‘Top 10’ guys. No way. You have to pay 100% attention, otherwise, holy moly - ‘What?!?! You didn’t get that awesome cuttie on my seventh wave?! What were you doing?? ?’ etc. Eventually, it was easier to find reasons to not go and be a cheerleader / photographer / board caddy / banana peeler. But the pull of his number one love remained strong, and has grown even stronger. Nothing, and I mean NOTHING gets in the way of this man and his surf. I can (almost) stand the conversations (read monologue) about the conditions, tide, board / fin performance in response to ‘how was your surf?’ I can also (almost) deal with the constant hankering after new boards, and why he really, really needs a rounded nose, double concave, planing hull Bonzer (is that even realistic – I just hear these phrases). Changing tides and split personalities. The ocean mirrors us. What I have real problems with is when there is no surf. Surfing is an addiction. There’s no two ways about it. When there is no surf, or there are injuries and illnesses, it’s like living with, well, a cross between an angry Incredible Hulk and Hyde. I daren’t mention anything water or wind related. The household walks around on eggshells, while my normally handsome husband stomps about snarling. Even the dog recognises the signs. Guaranteed though, there will be someone who picks this moment to call and describe in great detail the surf they’ve just had. I mean, why would you do that to me? Conversely, when the planets align, there is so much joy and happiness. Smiles from ear to ear, attention, affection. The sun almost literally beams from this guy’s face. I love him even more for it – this is the man I fell in love with. 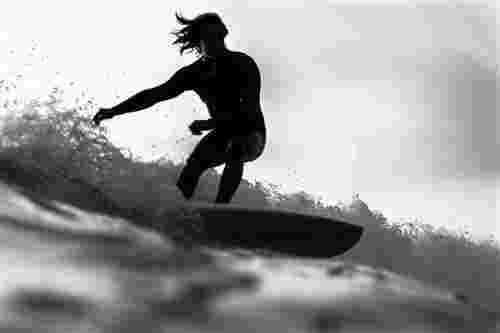 When the waves are good, the smiles come but without them things can be different. Recently we’ve been having a few family surfs. My generous husband surfs first, while I muck around in the white wash with our son, then we swap. Usually the exchange happens as conditions deteriorate, however, last time, I think they had actually improved. I caught some corkers. I was whooping like a crazy lady. I was remembering what this lark was all about! My energy levels are near to pathetic, but no worries, after no time at all I was back with my men. ‘Did you see that wave?’ I asked. ‘Did you see that sick bottom turn?’ I continued, it was all I could talk about despite the lack of positive response from my family. I was buzzing. Life was fandabbydoozy. Why couldn’t they see? Why were they being so downright miserable? Oh. Right. Well, if you can’t beat ‘em, join ‘em! Now, where’s my board caddy – I’ve got to get more of this feeling! The moody man of the surf. Families and friends forgotten to the dawnie. A sacred time for addicted. There are no warnings on the 'learn to surf' tin. Here are some reasons for you to think twice before making the biggest decision of your life. Do Sustainable Surf Products Actually Exist? Sustainability in the surfing world and how much of it is about overpriced products versus things you can actually do to make a difference plus some laughs. Read more about Do Sustainable Surf Products Actually Exist?